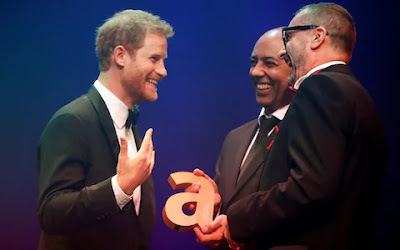 Prince Harry has accepted the Legacy Award at The Virgin Holidays Attitude Awards, powered by Jaguar, on behalf of Princess Diana, for her ground-breaking HIV/Aids activism. Harry, 33, paid tribute to his late mother as he collected the award at the star-studded ceremony at London’s Roundhouse. The Prince was introduced by Ian Walker, a former Senior Occupational Therapist at the London Lighthouse Aids centre, and Julian La Bastide, a former nurse at the Mildmay Mission Hospital, who discussed their experiences of meeting Diana and the on-going legacy of her HIV/Aids work. The award, presented in the 20th anniversary year of Diana’s death in a car crash in Paris, recognises the significance of her work in challenging the stigma and fear that surrounded HIV/Aids in the 1980s and ’90s.